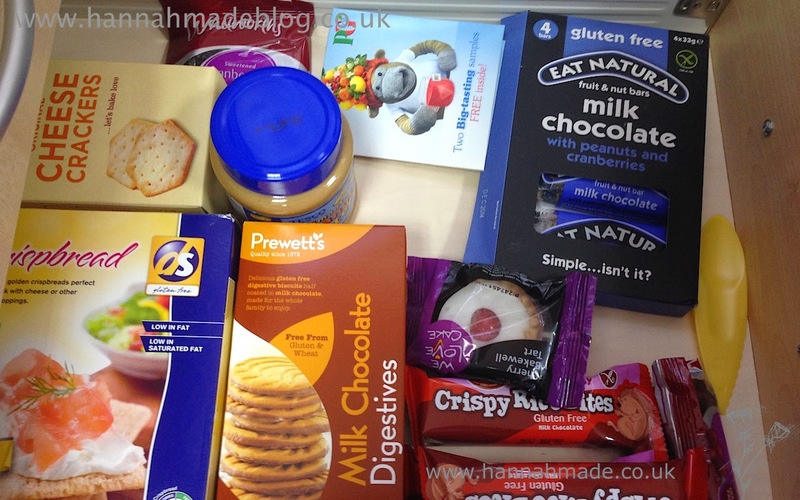 Hannah's Gluten Free : What's In My Desk Draw - Gluten Free Style! Today I thought I would do something a little different, I was sitting at my desk this afternoon and felt it was time for a naughty snack so I opened my desk draw where I keep my food and it suddenly occurred to me that since I no longer work from home all of us on a gluten free diet must have one of these draws at work, so why not show you what's in mine! As you can see many products are in the draw awaiting review, some have been recently been reviewed and some are long term favourites and what I feel are essential! so Lets take a look! These are always in my desk as I find them a staple, I do prefer the dark chocolate with raisins and macadamias but they were out of stock so I had to settle for these ones! They are good too but as a dark chocolate lover they can compare to my favourites. well this talks for itself really! I have a few bags of these dotted around, I find them a great low calorie snack as a bag is 100 Calories and I can't even manage to get through a third at a time, I would recommend finding unsweetended ones but that can be quite tricky so I normally settle for sweetened. I had two of these but the first one was eaten a few days ago, this one is sitting in my desk ready to be reviewed, so I need to resist temptation and not eat it until I have taken photos! I used to live on the fruity version of these, particularly when I was on holiday! But I think they are no longer produced as I have not found any in months, so I picked up a box of the chocolate ones, these are in my desk as a light snack but I will be reviewing these at some point in the future. These are purely in my desk for review purposes as a biscuit is quick and easy to try at work, I also brought these in my lunch break so I thought I would just keep them here as I have an obscene amount of biscuits at home. A pack of these are always by my side as these have a good texture, very little tastes and low calorie so they are great for eating cheeses, pates and anything you would put on toast really. These I recently reviewed here, but this pack in particular stays at work to eat with cheeses and houmous at lunch some days. We have bottled water at work so I sometimes give a squeeze of this into the bottle to have something a bit different. I keep it in my desk so I don't lose it on the mess I call my desk! Sample sizes are great for work so I tend to have packs of various mint, green or fruit tea in my desk, you'll never find 'normal' English tea as I cannot stand it! I have a very small love affair issue with peanut butter so I have a tub at all times, I eat it with vegetable batons and the DS crispbreads, its high in protein so it can't be that bad! Todays post was a little different but if you're anything like me, it satisfied a bit of nosiness on a monday afternoon!